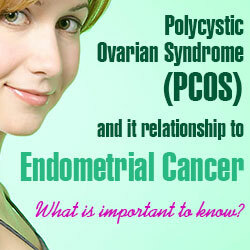 You are here: Home / Conditions / Polycystic Ovarian Syndrome (PCOS) and it Relationship to Endometrial Cancer: What is important to know? We interpret the thickening of the lining depending on the woman’s age. In a postmenopausal woman a lining above 5 mm in thickness is considered abnormal. Hello, I recently had my overies and fallopian tubes removed due to having pain I did have endometriosis on my uterus which was taken out last year . My doctor found endometriosis on my overies now and is going to test. Should I be worried considering he already kows it’s endometriosis. I’m sending it to several friends and also sharing in delicious.